This was a nice change from traditional casseroles, thanks to Pinch of Yum! We have been loving the addition of quinoa to our menu planning ever since Caroline and I had it at the Kids’ State Dinner in 2012 as one of the menu items at our White House luncheon. We’ve used it in all kinds of dishes, and we’ve made the White House menu item the most. However, recently I tried it in a casserole, thanks to the website PinchofYum.com. 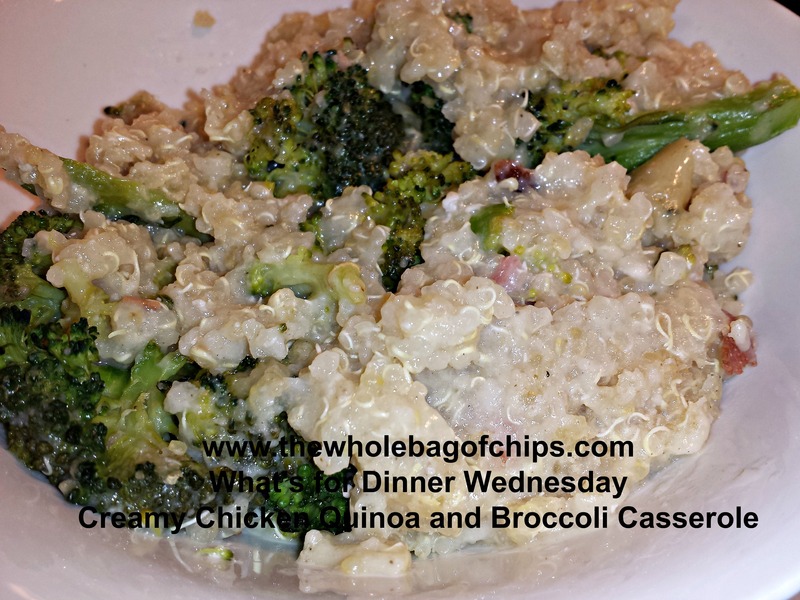 Her Creamy Chicken Quinoa and Broccoli Casserole came across my virtual desk at one point and I decided to give it a try. The recipe was delicious and it was a great deviation from some of our regular casserole dishes. We had all of the ingredients, including the bacon. She said in her recipe that any type of cheese would work, so we used shredded cheddar. I hope you’ll give Pinch of Yum’s recipe a try! I have it below, and I’ve linked to her site above also. I encourage you to check out the nutrition information and cooking notes that she’s included in her recipe write up. It will give you some tips on how to cook quinoa as well as some cook time information.